The objective of the Hellenic EPISCOPE pilot action was to develop tools to assist policy makers in mapping the energy quality of the building stock, assessing the effectiveness of different strategies proposed for the energy performance upgrade of the Hellenic residential sector and setting up a realistic refurbishment plan on strategic regions and/or building types. 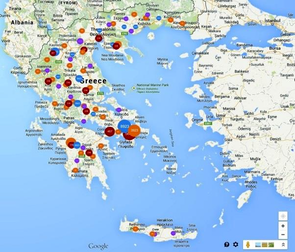 - The latest available statistical data from the Hellenic Statistical Authority (ELSTAT). A thorough analysis of raw data from the latest survey carried out in 2011-2012 by ELSTAT on the “Energy Consumption of Households” allowed a better insight of the current status and trends of the Hellenic building stock. Field audits in over 80 refurbished dwellings (representative of the building typologies) for the collection of data on the actual energy use “before” and “after” the implementation of popular ECMs. Field surveys of homeowners reaching out to 210 dwellings for the collection of data on the current behavioral changes and trends in the use and operation of heating systems. 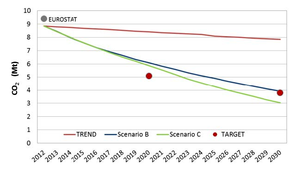 The BSM was used for scenario analysis to assess whether it is possible to meet the national targets for the years 2020 and 2030. Different energy conservation measures were assessed. According to the main findings of the pilot study, meeting the national targets requires combined measures that involve actions to minimize heating demand, the use of high efficiency equipment and systems coupled with central solar assisted systems and potentially solar thermal assisted cooling or PV driven heat pumps. To lower the CO2 emissions it is necessary to switch from oil burning technologies towards natural gas and electricity. However, turning to electricity for heating, needs to advance with caution in order to minimize a negative impact on power capacity of the grid, especially in the islands served by limited autonomous power plants. Given the fact that this study did not look into decarbonisation of central power generation, on-site or nearby building green power generation (e.g. PV or CHP) additional savings could be achieved as a result of using power generation technologies with lower emissions. Using the building stock model described above, a new tool eBSM was developed within the frame of the Hellenic pilot study that provides the means for a realistic assessment of different short/long term strategies towards achieving the national targets for reduction of final energy and CO2 emissions. In order to further facilitate the monitoring of the building energy certification process the tool is enhanced with a Google Maps application that provides an on-line geographical distribution of EPCs that reflect the spatial distribution of energy performance rankings of the building stock. The eBSM tool can be used by policy and decision makers for national as well as regional scale studies. 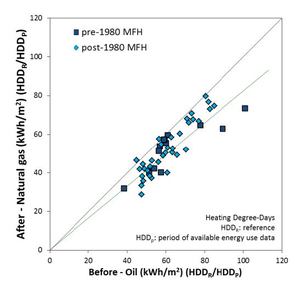 Representative results for weather corrected actual final energy consumption before and after replacement of an oil-fired boiler with a natural gas boiler in pre- and post-1980 Multi-Family Houses (MFH). 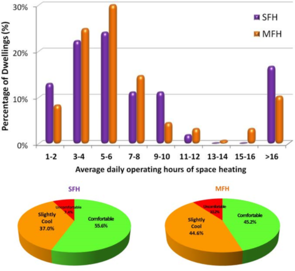 Representative results on behavioral changes of occupants related to space heating and prevailing comfort conditions in Single (SFH) and Multi-Family Houses (MFH). Application in Google Maps for EPC monitoring. Scenario analysis results for three energy conservation packages.